Drama. 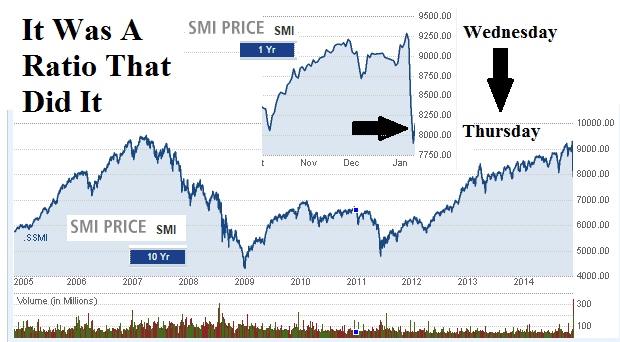 They say that it was a “tsunami” that swept through the World financial markets last Thursday and caused the equivalent of about US$800 billion to be “vaporized” between bankruptcies in the foreign exchange trade and an intra-day loss of about $100 billion Swiss Francs (CHF) in the Swiss Market Index (SMI) (Reuters, January 15, 2015, Swiss central bank shocks markets with currency “tsunami”). 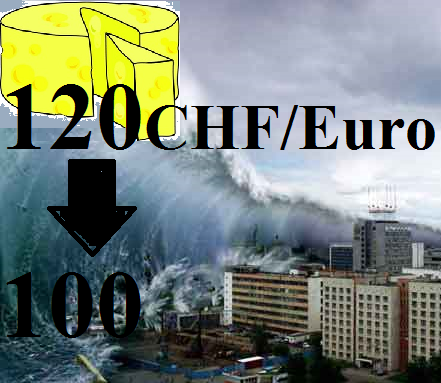 But it wasn’t a tsunami – it was a “ratio” – the ratio CHF/Euro=120 that guaranteed that 100 Euros could buy no less than 120 CHF guaranteed by the Swiss National Bank (SNB), the central bank, that instantly fell to CHF/Euro=100 or less when the SNB dropped the “cap” and allowed the Swiss Franc to lift and rise up against the Euro and, therefore, against any other currency. The demand for the Swiss Franc has always been strong, but it became much stronger since 2009 (please see the chart on the right) and became a landslide in December with a huge influx of lazy money in rubles, yuan, and dinari, for example, looking for a safe harbor in Switzerland which they couldn’t find at home. 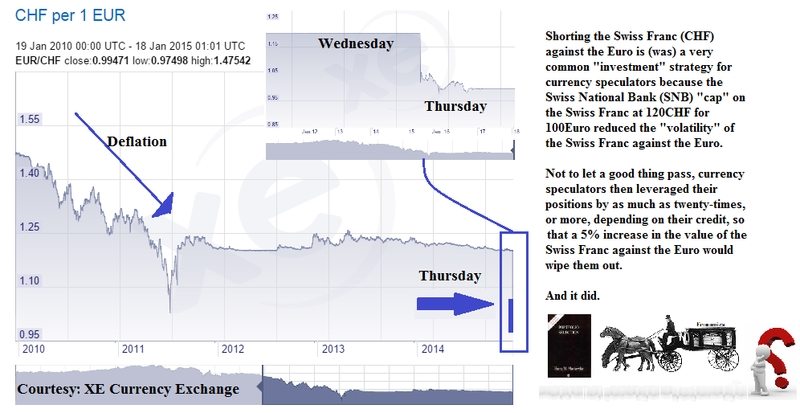 And Switzerland is a distinguished exporting nation in high-value goods and services, and in its currency, and the natural response to a persistent and increasing demand is to raise the supply, and the price, and the Swiss central bank did both with respect to its currency by printing more money, as it saw fit, and, secondly, by raising the discount, or interest rate on deposits, from a small positive return to a negative return and, most recently, minus 0.75% (-0.75%) on central bank deposits. Figure 2: It was a Ratio that did it. Both moves help its industry by helping to keep the price of the Swiss Franc low, or predictable, against the other currencies that buy its products; but the downside is that the interest rate earnings on bank deposits and government bonds are low, which means that its wealthy citizens who don’t have to work, but can live on the interest, will have a declining income against the Euros that they need to buy things with, and they will need to look elsewhere for it – which they did, in the stock market; please see Figure 2 on the right. The central bank move is certainly a gift to Swiss consumers – their Swiss Francs can buy more today than yesterday – but it’s a one-time gift and it will cast a shadow on its companies which will have to deal with higher prices for their exported goods and services, possibly offset by lower prices for their inputs and materials. But the knee-jerk and mechanical reaction of the stock market investors is good for us because we have reason to think that the long-term deflationary pattern of the Swiss economy will not be so easily reversed by playing with their “money”; please see Figure 3 on the right which explains how the Swiss Franc figures in World and Euro Area trade. What are they going to do for an income? And, so, what are they going to do for an income? To get an income, they need to invest, and that means that they want 100% capital safety and a hopeful return above the rate of inflation; anything else is just a gamble and that’s everything else (The Economist Buttonwood, January 19, 2015, Swiss miss). 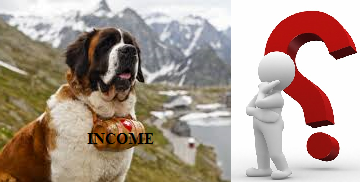 For more examples from the Euro Area, please see our Posts “(P&I) The One World Food Bank” and “(P&I) The World Trader’s Almanac“, and for the Country Risk, “(P&I) The NYSE Mittelstand“.